True to form, Adam and I didn’t have a lot of time to explore Panama City. Our trip to Panama was a true weekend trip; we left in the late afternoon on a Friday and were back home in Washington, DC shortly after midnight on Monday—and yes, we were both at our desks by 8 AM. 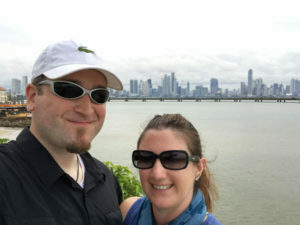 Inspired by the Panama Canal and motivated by a great airfare deal, we booked our trip expecting to see only the canal and assuming anything else we could cram into our Sunday before leaving for the airport would be icing on the cake. 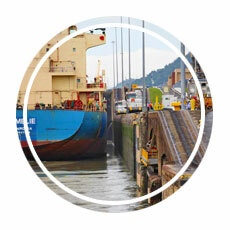 We had an excellent day on the Panama Canal, and we arrived back at our hotel exhausted and ready for bed. We were so tired we didn’t even bother with dinner, so we went to bed early and woke up rested on Sunday morning. 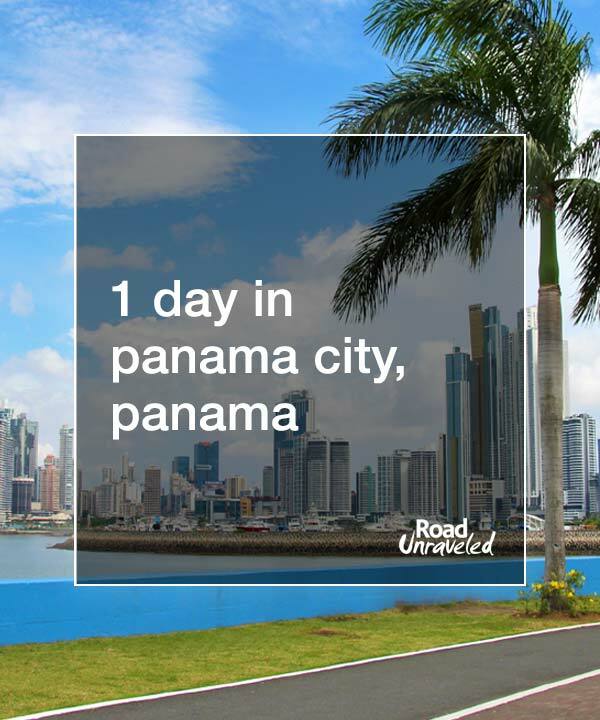 By the time we were ready to check out of our hotel we had exactly eight hours to see what Panama City had to offer. 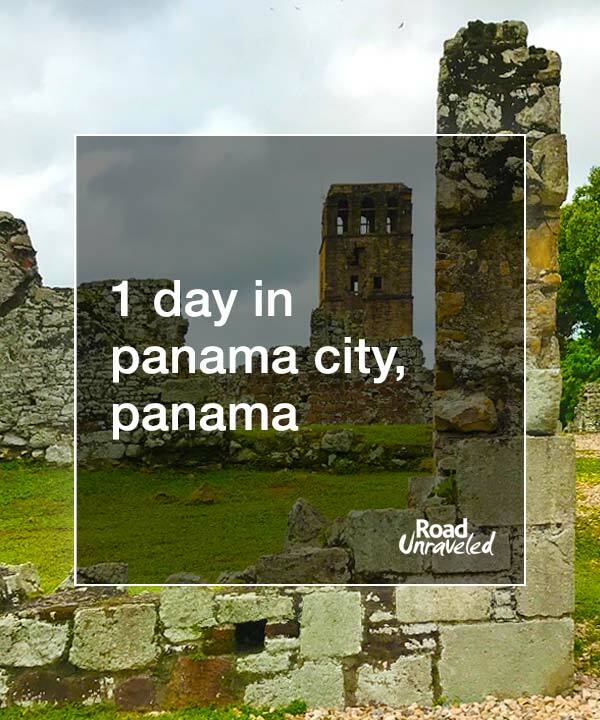 Whether you have a long layover, a day in the city as part of a cruise itinerary, or embark on a whirlwind weekend trip of your own, here’s what we did and discovered in just one day in Panama City. 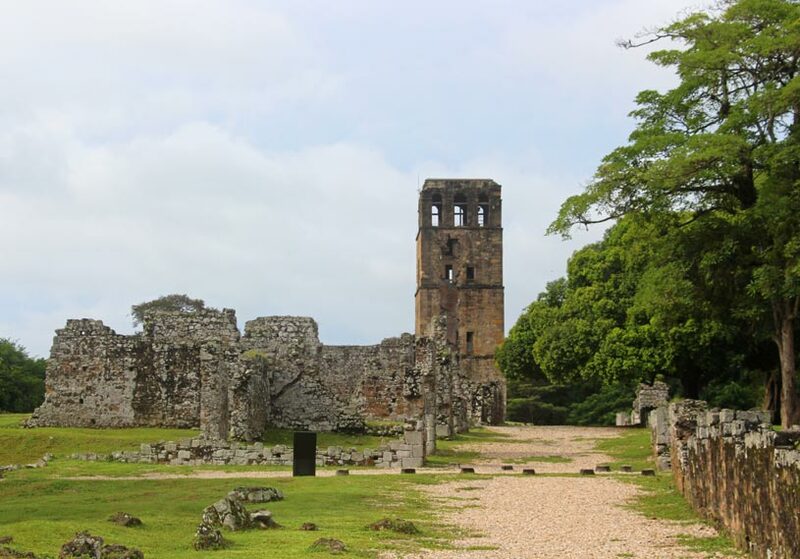 Our very first stop was the UNESCO World Heritage Site Panama Viejo, located in the northern part of the city. We hailed a cab to get there (well, in fairness, he hailed us; as we were discussing our itinerary a driver honked twice and pulled up alongside us. I guess we had the look of tourists who needed a ride!). 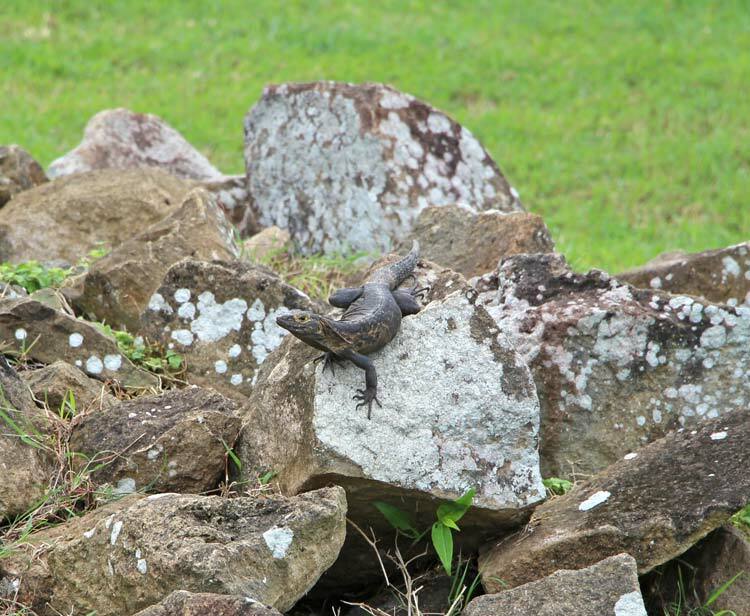 Because we arrived just after the opening time, we were two of just a dozen or so visitors ambling about the site, which made for a very relaxing experience! 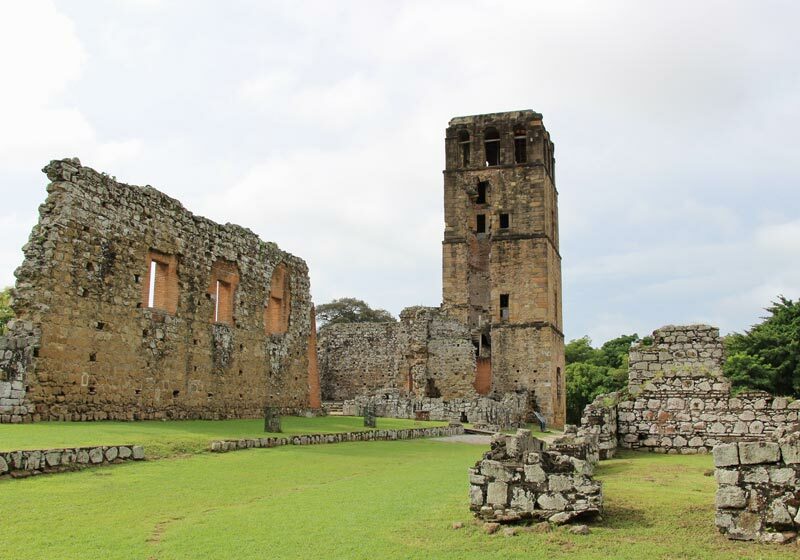 Panama Viejo is all that remains of the first European settlement on the Pacific Ocean. Originally founded in 1519, the city boomed during its first century as it grew from 100 inhabitants to more than 1,000. That number quintupled by 1619, when the population reached 5,000 people. The city thrived as homes, places of worship, and trading posts dotted the landscape. All of that changed, though, in 1670. 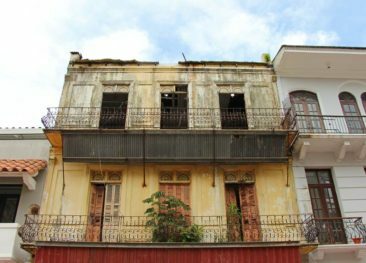 By then, the population had swelled to more than 10,000, and despite repeated pirate attacks and natural disasters, the city continued to grow. 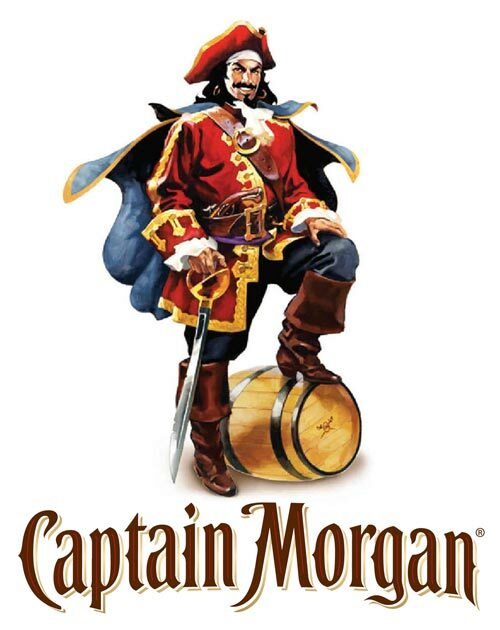 On January 28, 1671, Henry Morgan—better known as Captain Morgan—led a brutal attack on the city. 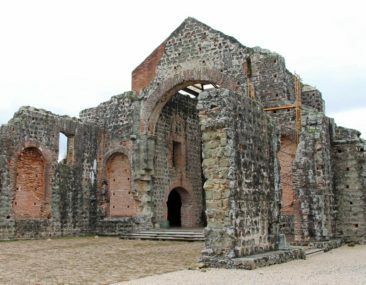 Under his orders Panama Viejo was lit on fire, and thousands of people perished as most of the buildings went up in flames. The city wasn’t salvageable, and ultimately Panama City was reestablished several miles away. 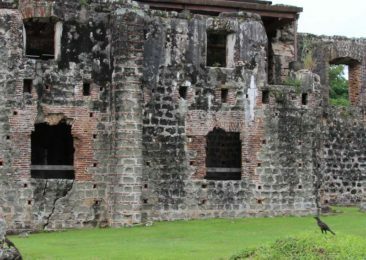 Today, what is left of the oldest settlement serves as a popular tourist attraction and a fascinating look at what city life might have been like for those who lived there. The site is well-labeled with large placards providing context for the ruins visitors can walk through. 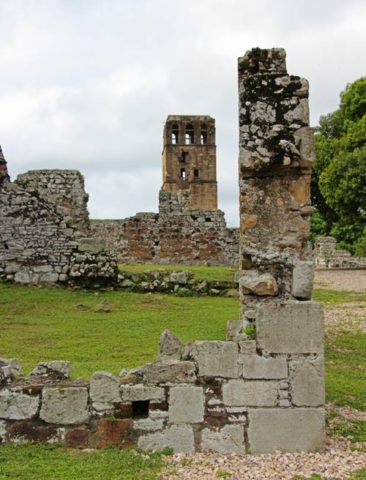 The highlight is certainly the best-preserved building of the group, the Catedral de Nuestra Señora de la Asunción, where one of the towers stands mostly intact. Surrounding it are the ruins of houses—primarily where wealthy citizens would have lived. We spent a bit more than an hour wandering through the ruins, which span about a half mile in length. 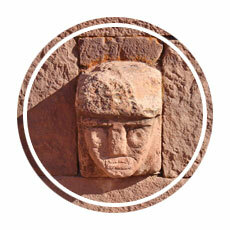 There is a museum available to visitors, but we skipped it because the ruins themselves told a great story. 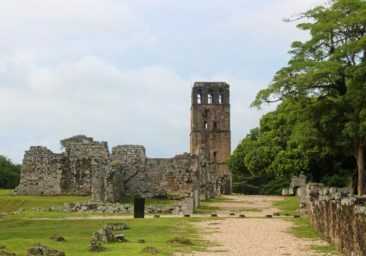 We both agreed that we were happy to visit during the morning, when it was hot and humid but less oppressive than midday; there’s little to no shade at Panama Viejo, so avoiding it during the heat of the day is a smart strategy. That said, visiting a site that was settled almost 500 years ago would have been worthwhile even if the temperatures were even hotter than they were. After Captain Morgan and his men destroyed Panama Viejo, the remaining citizens moved several miles down the coast to establish their new home in January 1673. Casco Viejo has enjoyed a much more peaceful existence, and today it is Panama City’s historical and cultural capital. 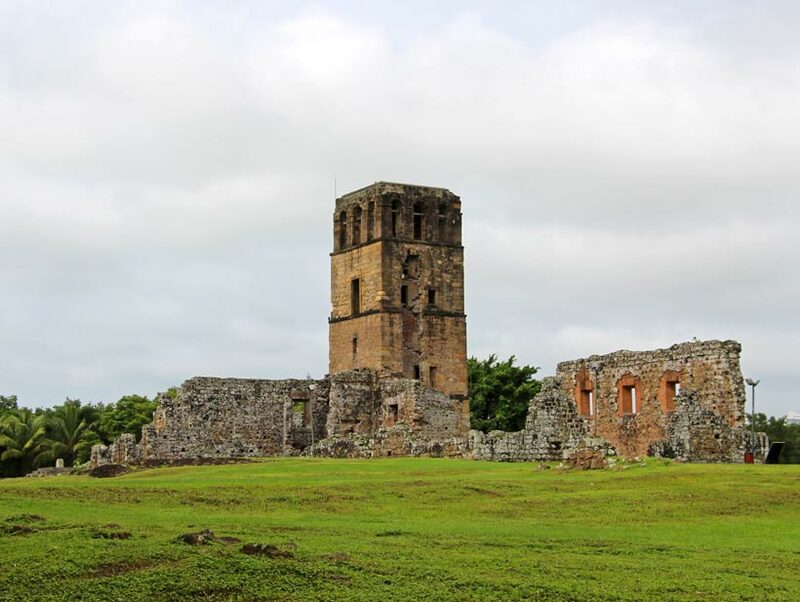 It’s also been recognized as a UNESCO World Heritage Site. 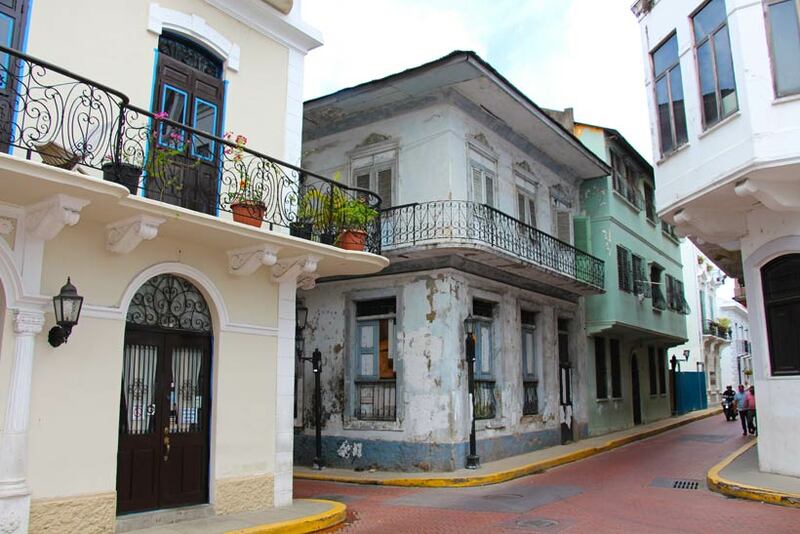 There is plenty to see and do in Casco Viejo, and we enjoyed a nice, leisurely stroll through the old town. 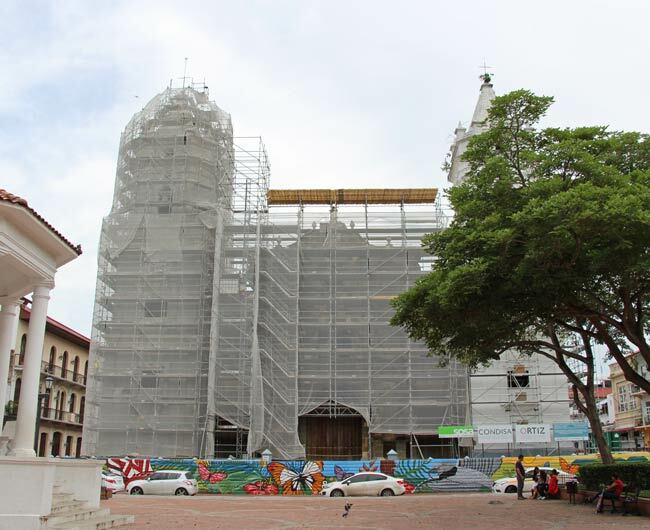 Our one disappointment was La Catedral Metropolitana, Panama City’s primary Catholic church, which was completely covered in scaffolding as it undergoes renovations for Pope Francis’ expected visit in 2019. I’m sure the structure is impressive, but it looked oddly preserved wrapped in plastic as we gazed up at it from Plaza de la Independencia. 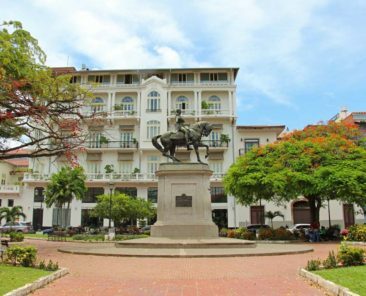 Away from the main square, Casco Viejo boasts beautiful architecture, gorgeous ocean views, and dozens of spots to eat, drink, and shop. 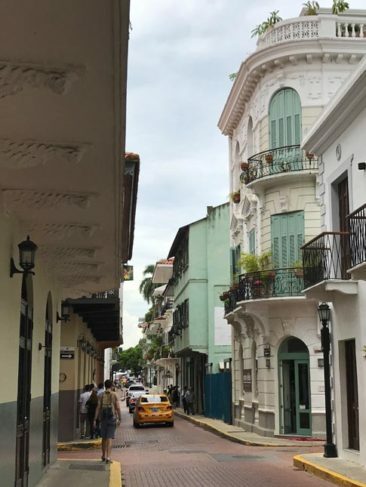 There’s good reason why so many visitors make Casco Viejo their jumping off point; we were overwhelmed by the abundance of restaurants, coffee shops, and stores, and we easily could have spent a few days exploring and getting lost there, even though physically Casco Viejo is not very big. 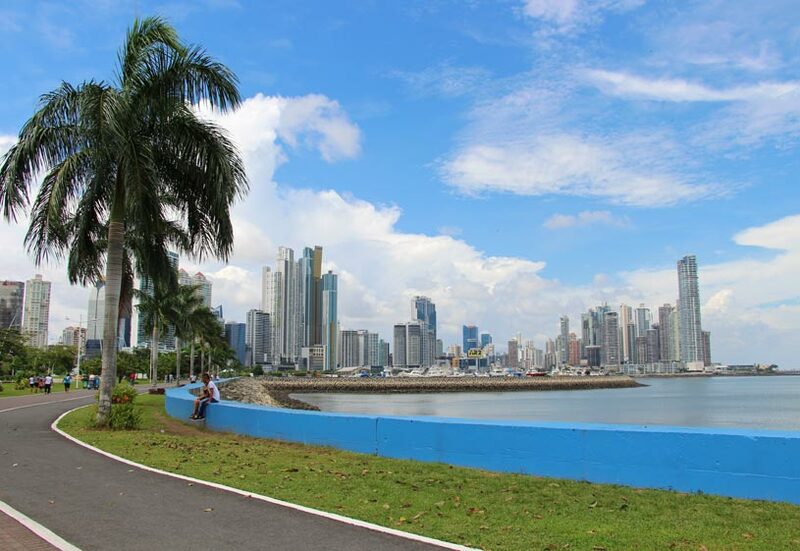 The neighborhood provided a great introduction to Panama City! Taking a walk along busy Avienda Balboa could be all you need for an entertaining afternoon. 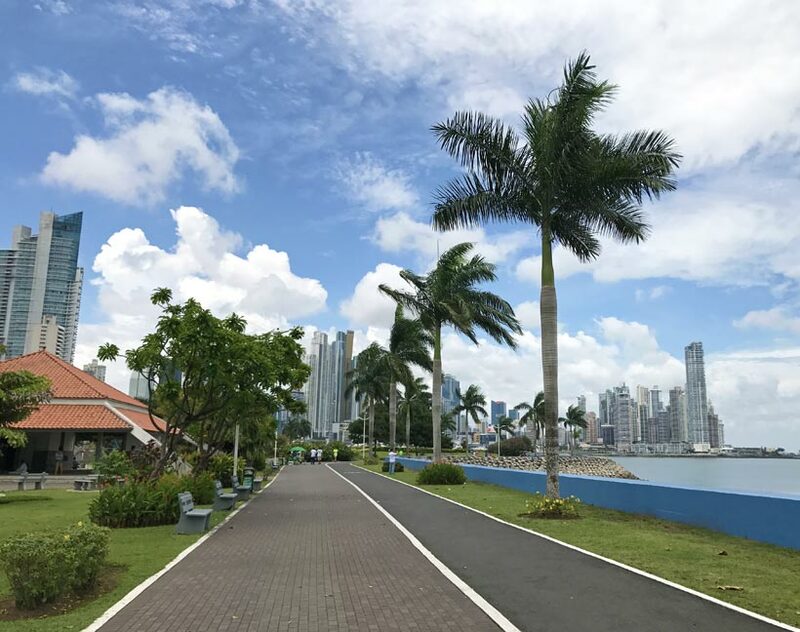 We decided to take advantage of some unexpected blue skies during Panama’s rainy season by walking from Casco Viejo back to our hotel, a bit more than a two mile walk. 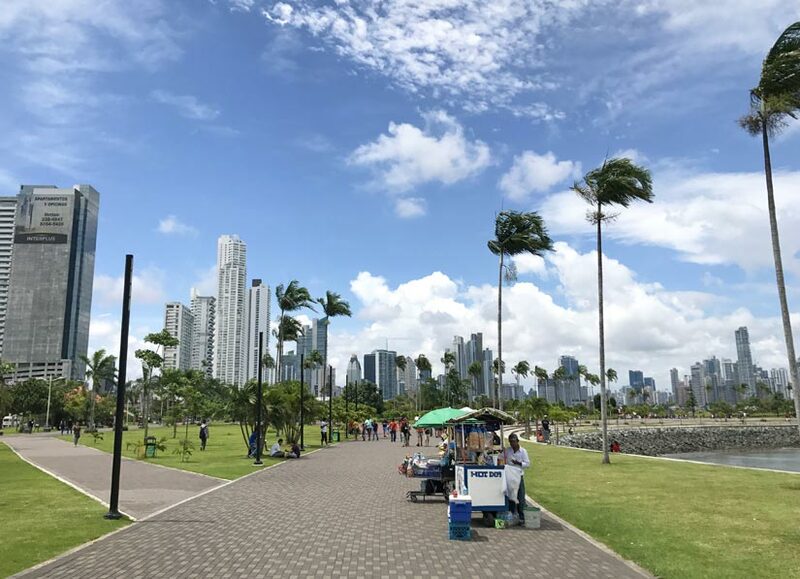 We followed the pedestrian path alongside Avienda Balboa, which provided some unbeatable views of the Pacific Ocean as well as some great people watching! 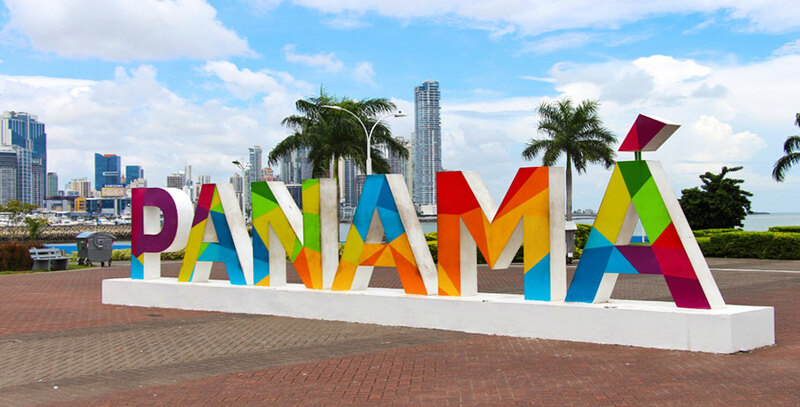 Our favorite stop was in front of the iconic Panama sign, a giant colorful piece of artwork that depicts the city’s name. Situated in front of a nice fountain, I thought the best views were those that combined the sign, the cityscape, and the ocean. 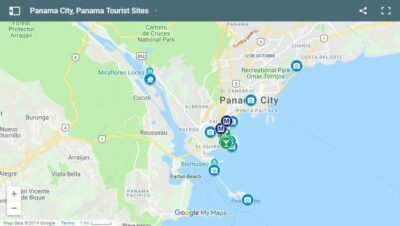 Take a look at our map below for the exact location of the Panama sign. Beyond the sign, Casco Viejo was easy to spot as well. We spent a while in that spot, watching as vendors selling water and shaved ice peddled their wares to sweaty passerby. Even when we decided to move along ourselves, the looming skyline sat firmly in our view. It’s a terrific walk and a lovely way to see the city. Empanadas are a must in Central and South America, and you can find them on just about any menu whether you are in a coffee shop, at a restaurant, or passing by a food stall. We tried varieties that were baked with doughy shells, deep-fried with greasy shells, and lightly fried with flaky shells. Fillings are usually traditional, so look for lots of cheese, chicken, and beef. Emanapadas are a delicious, satisfying snack. 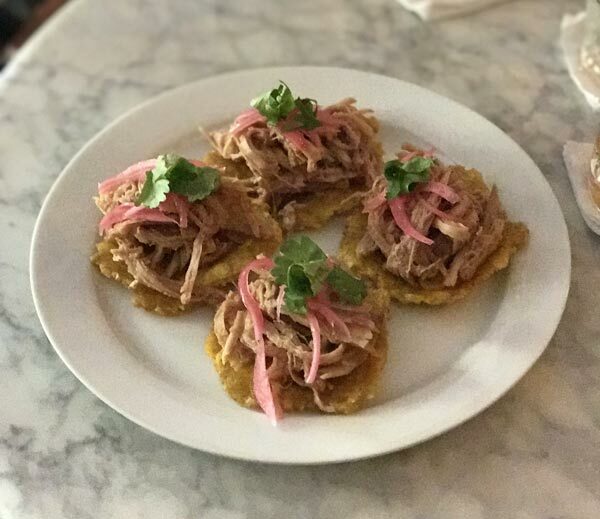 One of my favorite dishes was patacones, or tostones, twice-fried plantain that are often layered with meat or other toppings. They are frequently served as a side dish, and we enjoyed them as a snack piled high with pulled pork. While I saw some that appeared to be crispy, we thought they were perfect when they were soft and still sizzling a bit from the fryer. You can’t go to Panama City without trying the local specialty, ceviche. 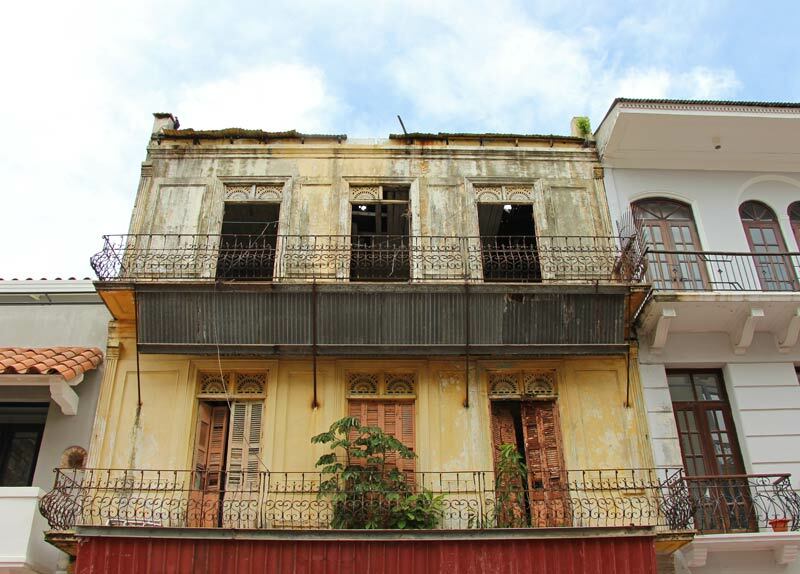 The best place to find it is close to the fish market, which is just a 5-10 minute walk from Casco Viejo. 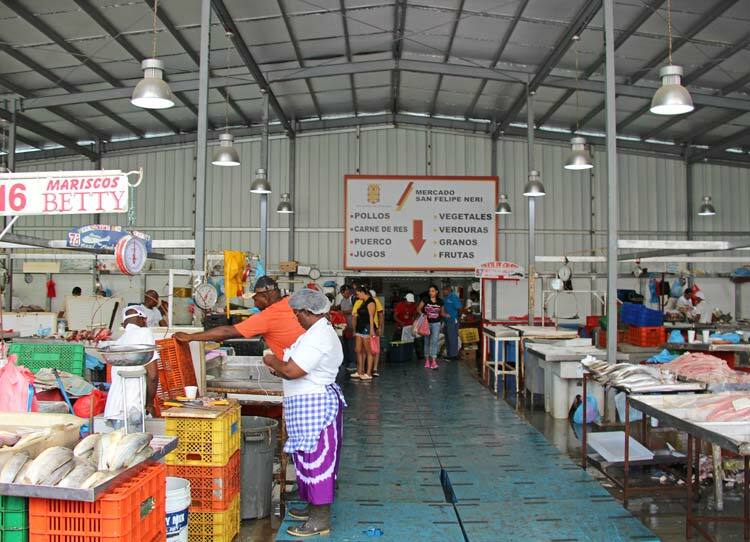 We accidentally walked into the fish market itself, which is where locals purchase fresh fish of all varieties to prepare at home. Since that clearly wasn’t the right spot, we walked back outside and followed the sound of a thumping electronic beat to the ceviche stalls, which looked more like an outdoor party than a line of restaurants. Hundreds of people crowded around, dancing to music blasting from cars and huddling around tables to have their meals. 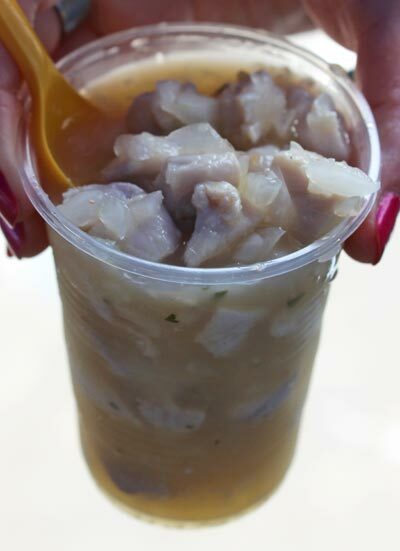 There are more than a dozen spots that serve almost identical menus, so we purchased a plastic cup brimming with fresh ceviche for just $1.75 and devoured it in a corner of the market away from the hot sunshine. The ceviche was fantastic—small chunks of white fish, tons of onions, and a lot of sour lime brine. It was a great snack—plenty of food for the price—and checked off a major food item from my list of things to try in Panama. 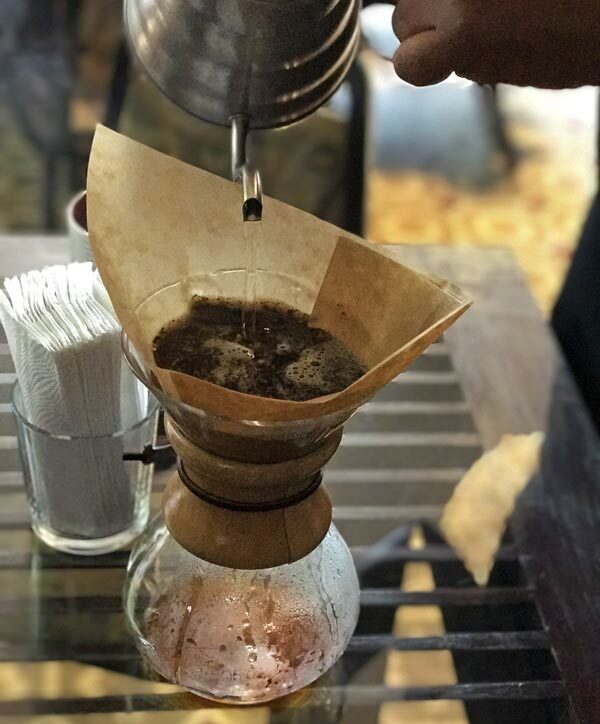 We went to Panama on a mission to try the world’s most expensive coffee—geisha coffee. Grown at a higher altitude than most other coffee beans, a single pound of geisha (or gesha) sells for anywhere between $50 and $80! Adam especially is a coffee connoisseur, and he talked about finding a cup almost nonstop during the weeks leading up to our trip. We stopped into Café Unido, which is famous for selling geisha coffee, and ordered two cups along with some empanadas. The woman behind the counter shook her head—“No geisha,” she told us. Adam looked at her in disbelief. “How can there not be geisha coffee?” he asked. The woman shrugged and pushed forward a few other bags of coffee we could choose instead. A bit defeated, Adam ordered a cup of Finca Lerida, which was indeed very, very good—smooth with hints of chocolate and citrus. Caffeinated and hopeful that we might still find a cup of geisha before leaving the city, we walked two blocks down the road to Café Sucre. Café Sucre is a fun, upbeat little gem that was busy but not crowded when we arrived. One of the baristas approached us with a big smile and offered us a menu. “Do you have geisha coffee?” Adam asked. The barista laughed. “Um, hellooooo—this is a coffee shop!” he reminded us. We laughed, too, and with a round of high fives and a quick stop at the cash register to pay ($9 for one cup, which we agreed to share) we were ushered to a table to wait. Our barista emerged with a kettle in one hand and the coffee in the other, and he provided us with a bit of coffee theater as he poured hot water over the grinds while telling us about the origins of geisha coffee. We waited about four minutes for the coffee to pass through the filter, at which point our barista returned with a few mugs and served us. Geisha coffee lived up to the hype. It’s light, fruity, and floral—almost like the tea of coffees, reminiscent of Earl Gray tea. We savored every drop, chatting with the baristas as they scuttled throughout the shop, and when our cups were drained we were a bit sorry to go. The coffee was every bit as good as we hoped it would be, but the experience itself was such a pleasure. As we walked out the door and waved goodbye, our barista yelled, “Don’t forget me!” We definitely won’t. Leaving Panama without trying some of its famous rum was out of the question, so we had a quick snack and a round of drinks at Pedro Mandinga in Casco Viejo. Panama has a great climate for growing sugar cane, and rum production is now a big industry that has promoted the rise of some tasty cocktails. Pedro Mandinga distills small batch rum, and if you ask the servers will gladly provide a complimentary sample of silver rum and spiced rum. The silver rum is smooth with notes of sugar and banana, and the spiced rum has a nice cinnamon flavor that is tempered by vanilla and orange notes. We tried a couple of drinks; Adam loved the spiced rum and ordered the Portal de Caldas, which blended in bitters and juice; I opted for the Cimmaron, which combined coconut-infused silver rum with pineapple and sparkling wine. We were both very happy with our choices; Pedro Mandinga is a great place to try artisan rum, but when it comes to Panamanian rum, you can’t really go wrong! We booked our trip knowing July is the rainy season, but we were in no way rained out of any activity we planned. During the couple of days we spent in and around Panama City we saw rain, but if often fell hard and fast for just 10-20 minutes before easing up completely. The most rain we experienced was early into our cruise on the Panama Canal, when 20 minutes of hard rain sent us scrambling for cover, but when the showers passed we had cloudy skies that eventually gave way to the sun. On our last day we enjoyed so much sunshine that we decided to walk from Casco Viejo to our hotel, and we ended up with great pictures featuring blue skies. 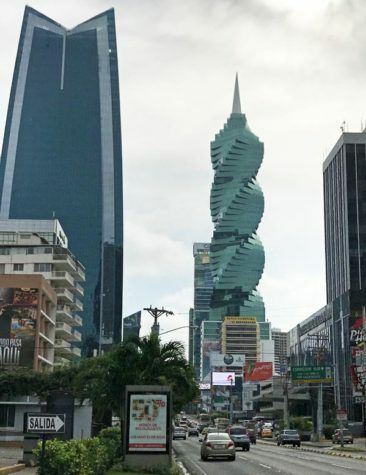 Visiting Panama City during the rainy season shouldn’t cause you alarm, but take an umbrella and a raincoat wherever you go in case a storm or two pops up and takes you by surprise. This is true even during the three months of their “dry” season; as our Panama Canal guide explained, Panama has a rainy season and a dry season, where it rains just a little bit less every day. 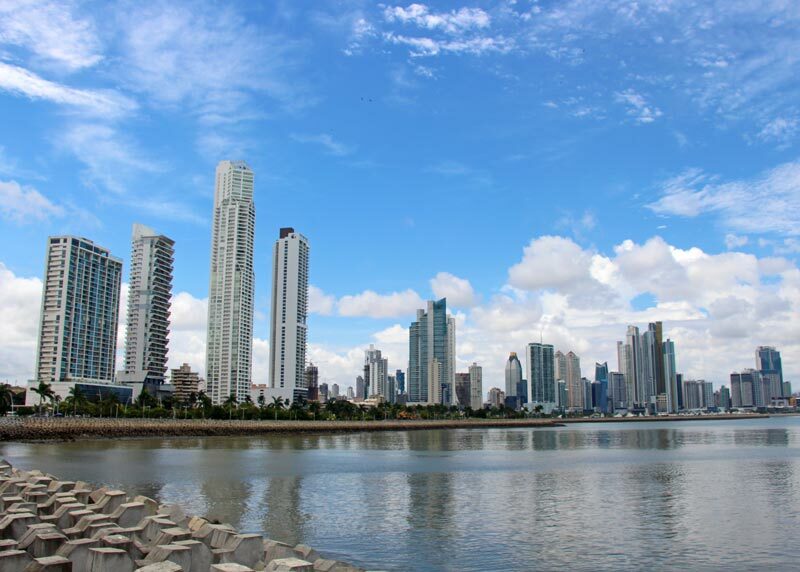 Panama City has plenty of taxis, buses, and a metro system that is pretty convenient to most of the city. Because our time was limited we relied on taxis, and they were by far our biggest expense in the city. A taxi from the airport will cost around $30, although we heard some people paid more than that depending on if a taxi driver charges for the tolls on the Corredor Sur. We paid $35 to get into the city and $30 to return to the airport. Some cab drivers will not make change for you, so have close to exact change for any trip you take. No taxi has a meter, so if you are concerned about the price ask about it before getting into the cab; in the city, we paid about $10 no matter where we were going, including a long trip from Flamenco Marina back to our hotel in the Marbella neighborhood that was snarled by heavy traffic. 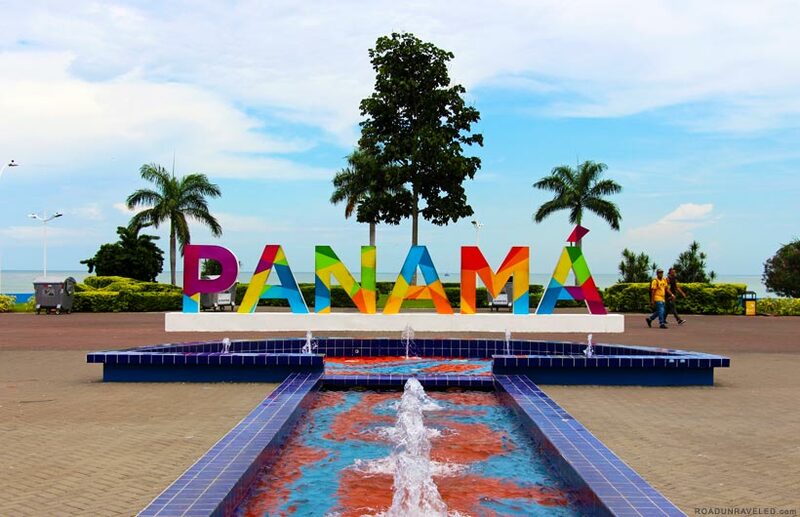 Look for the colorful Panama signs around town! 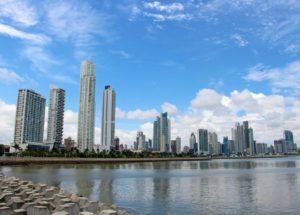 Uber is also popular in Panama City, but because we often had unreliable access to internet we didn’t use it while we were there. 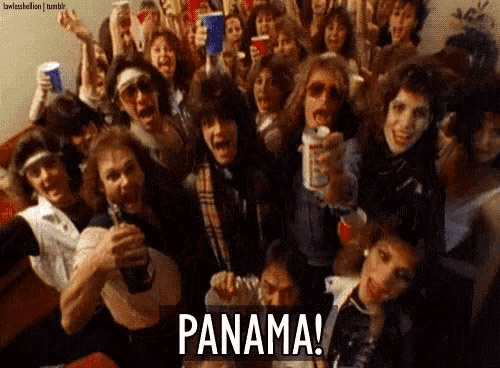 Panama’s official currency is the Balboa, but you won’t find it in circulation—Americans will be surprised to find it’s the US dollar that is used in all transactions! 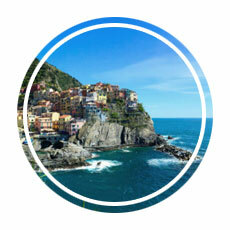 While you may get Balboa coins as change for a purchase, dollars are the only paper currency you will use during your stay. For US citizens that will make your visit just a bit easier—stop by an ATM at home before you leave for the airport and don’t worry about seeking out an exchange counter at the airport upon arrival. Leave your large bills at home, though; most businesses won’t accept 50 or 100 dollar bills, so don’t carry anything larger than a $20—and smaller is preferred. 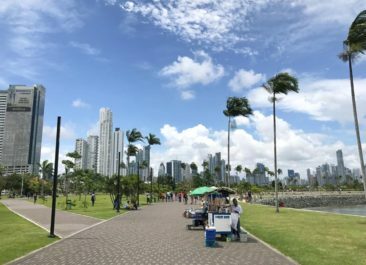 Credit cards are somewhat widely accepted in Panama City, but you’ll need cash for food stalls, taxis, and some shops. This map has the location of some of the main spots we mentioned in this post. We hope this helps you plot an itinerary for your own trip to this wonderful city! We booked a room at the DoubleTree mainly because of its location- it’s in a safe area and it’s close to a metro stop, although we didn’t end up using public transportation. We were only about 10-15 minutes away from both Panama Viejo and Casco Viejo by car, which was very convenient. 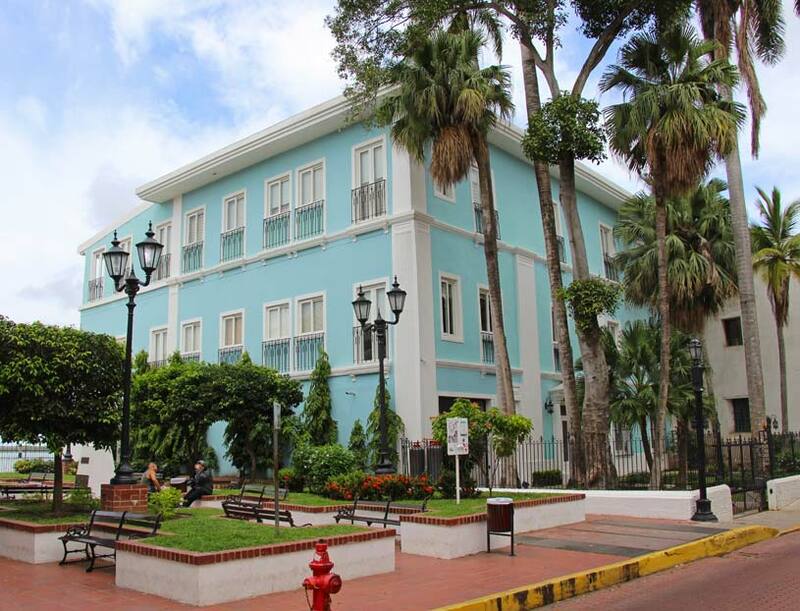 We found the hotel to be very well priced, although we got what we paid for: the room was comfortable but basic, and because we weren’t in the room much that weekend we didn’t mind paying a bit less to stay outside tourist hotspots like Casco Viejo. Plan Your Visit to Panama City, Panama! Panama provided us with one of the best weekend trips we have ever taken. Everything—our day trip to the canal, the sightseeing, the history, and the food and drink—surpassed our expectations and left us eager to plan another trip in the future. If you have ever considered taking an international weekend trip, add Panama to your list if you are from the US—if you can find an inexpensive, direct flight like we did, you’ll be amazed at how much you can do in a short time. And if you’re like us, you’ll be left with amazing memories and a deep desire to do it all again soon! 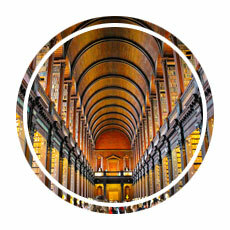 Get inspired for another vacation by checking out a few more of our favorite articles!